It is easy to spend extra money on impulse buys, summer treats, and keeping cool as the weather warms up. Spending a little extra on a day to day basis does not seem like a big deal, but it can add up fast. Here are ten ways you can curb expenses while still having fun in the sun. Every degree makes a difference in dollars on the monthly electric bill. Setting the air conditioner’s thermostat to a consistent 78 degrees during the day and night is just enough to keep the house comfortably cool. Utilizing ceiling fans and drapes to block heat from entering the house will efficiently maintain cooler temperatures. You can save hundreds of dollars when you stop blowing money on gym memberships and exercise outdoors instead. Summer is also a nice time to take casual walks. Walking instead of driving for quick errands that are only blocks away will not only save you money on gas, but it will also keep you fit and stress free from staying out of the traffic. Summer is a convenient time of the year to quit smoking because we are less distracted by holiday errands, leaving us free to focus on our personal goals. With cigarettes costing close to ten dollars a pack, even a light smoker can save major money from quitting. Bottled drinks can quickly add up in money just as fast as they do in sugar calories. You are much better off ditching the habit of buying drinks on impulse. You can also save money on bottled water at home when you invest in a decent water filter system. Netflix and Redbox have the market cornered for cheap movies that you can watch at home. Staying in guarantees the best seat minus the overpriced expense of popcorn, candy and soda. You are better off making your reservations early and shopping around online with sites that price compare all of the major hotel chains and airlines. Purchasing airline tickets any sooner than two weeks to your departure date can easily double their prices. Air drying instead of blow drying your hair is cheaper and more refreshing. Also, hanging the laundry outside to dry is an economical alternative that leaves clothes smelling fresh and lint free. You can support your local farmers while paying less to eat healthy when you take advantage of the cheaper prices of in-season vegetables at the local farmers’ markets. They are also a fun and inexpensive way to spend a day out with friends and family. Ice cream is a nice treat when the weather is hot outside. However, it can be expensive, especially when we buy it at the ice cream shops. Stocking the freezer with ice cream and yogurt bought in bulk is much cheaper. If you want to score even bigger savings, make your own popsicles at home. You only need to buy the molds once, and you can make healthy popsicles with real fruit that cost less than store brands. Kids love to go to waterparks, and it is a nice treat once in a while. Yet, you can have close to the same fun on a more regular basis by doing the home version in the back yard. Kids have a natural talent to improvise and create their own fun with basic sprinklers, mats and hoses. You can thank My Canada Payday for contributing this article. If you’re looking for a Canadian payday loan, as long as you are in Ontario, BC, or Saskatchewan they are your best bet for reliable service. In today’s economy, every penny counts. While it is hard to deny that many people are hurting financially, my wife and I have discovered a few tips to help you stretch your dollar further. One of the hottest things on the internet now are websites, such as Groupon, where you can purchase a great deal on a number of products. In our case, my wife and I managed to get our lunch at a local restaurant for half off. A great deal if you ask me. We put away so many things that we really never even realize the treasure trove that might be hiding in our closets right at this very moment. In my case, I had a job that required me to have hiking boots. This led to me having four pairs of boots that I did not really need. I was able to use two of the pairs, and I got rid of the other two. Another possible way, is through eating the food piling up in your freezer. If you are like my family, your freezer is chock full of frozen food that you haven’t eaten. So why not throw that in the microwave instead of going out for dinner? These are just a few of the great ways that my wife and I have saved money. What are some of the things that you can do? Most Americans and Canadians work very hard at their day jobs and earn for paying the costs associated with their well- being, those of their family members and the country. Of course, they do enjoy a good life and spend their youthful days without caring too much about their future. This is not the way to go. Along with enjoying your life, you must save a portion of your hard earned savings for protecting your interests in your future as well. Traditionally, most people invest their savings in government managed or private retirementsavings accounts. But, they can be seriously affected by the ups and downs of the world economy. Here are some ways to reduce this risk to some extent. 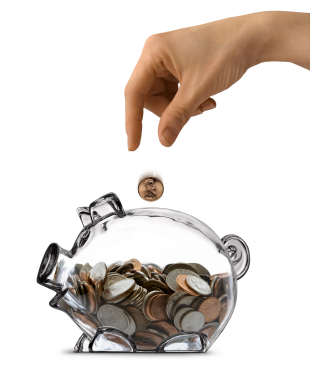 Spread out your savings in to various possible options like gold, real estate, stocks, bonds etc. and this would help you to reduce the impact of global financial downturns. All these sectors are never going to go down at once. Thus, the risks associated with your investment can be significantly reduced. Sticking within your financial constraints and avoiding debt is one way to reduce your hassles with respect to retirement. Any debt that you have to borrow must be paid back in full at the earliest instance. Life After Retirement: Are You Financially Prepared for it?